Note: Cabin heating comprises of an electrical fan heater. 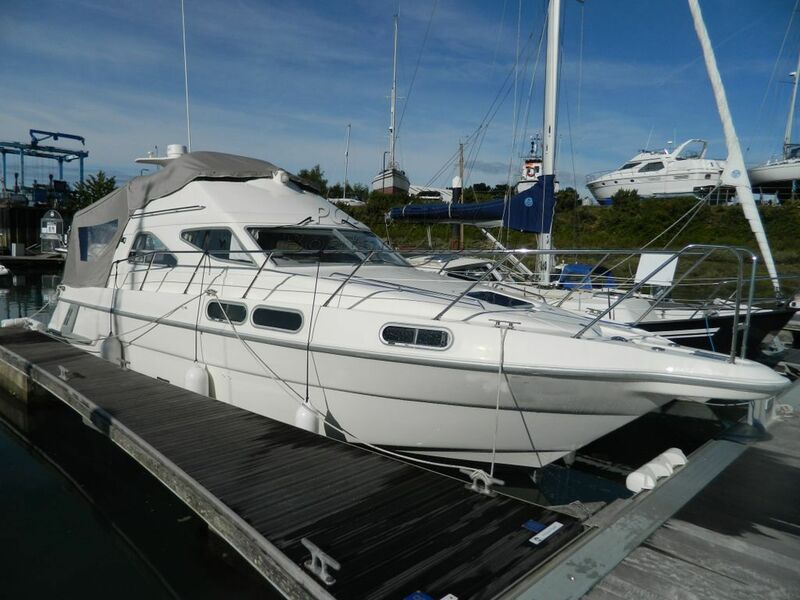 Boatshed Hayling Island are pleased to offer for sale a very nice example of the Sealine 310 Statesman. The 310 is a well thought out flybridge cruiser offering good accommodation, separate good sized heads and very good headroom height throughout the boat. This 310 is presented in excellent condition and in my opinion she looks almost new again. The current owner has spent the last 18 months upgrading and refurbishing this Sealine 310 to a very high standard and has spent a considerable amount of time and money on her with bills & receipts available for all work carried out. *New Volvo Engines (2017, both only have 15 hours of use. *New fuel pumps, water separation filters, starter motors, Alternators, new fuel lines. *3no New Heavy Duty Batteries. *The outdrives have been stripped and rebuilt this year with new seals, bellows, annodes and props. *New Cockpit and Flybridge Covers. *New Toilet and manual pump. *New Bilge pump in engine bay. *New Single lever throttles on Flybridge. *New Raymarine Chart Plotter (2018). *New Pioneer Stereo and Speakers. *New Memory Foam mattress in Forward cabin. She has also recently been antifouled, buffed and polished and is therefore ready to go. This Sealine 310 Statesman has been personally photographed and viewed by Bruce Mowatt / David Mowatt of Boatshed Hayling Island. Click here for contact details.